Florence Restaurants | Travel to Florence.com, your online travel guide. Florence is best known for its renaissance art, statuary and its famous residents. However, if you ask anyone who has ever visited Florence what the highlight of their visit was, they immediately start talking about their favorite Florence restaurant and the amazing cuisine. It is quite possible that the true artists of Florence are its chefs. Using the freshest produce and techniques handed down from hundreds of years of cooking; they create daily masterpieces for all of the senses. 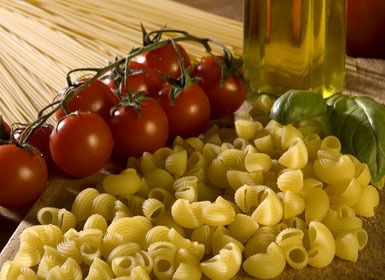 The Tuscany region is famous for the world's best olive oil, risotto, hearty bread and a mind numbing variety of cheese. "Bistecca Fiorentina"- A thick Italian style t-bone steak which is usually prepared rare. "Ribollita"- A hearty soup traditionally made with rustic day old Tuscan bread, tomatoes and beans and is easily a meal just by itself. "Chianti"- Made from the Sangiovese grape, it is ruby red in color and dry. With the exception of the more aged Riservas, Chianti's are usually inexpensive and go well with food. "Brunello di Montalcino"- Made from a variant of the Sangiovese grape called Sangiovese Grosso. The wine is produced in the town of Montalcino which is about 65-70 miles southwest of Florence. It is a complex wine with flavors and aromas of chocolate, violets and black cherries which pairs perfectly with game and grilled meats. Brunello is not a cheap bottle of wine but you can get a bottle of Rosso di Montalcino, which is the same grape but aged for a shorter period of time for considerably less money in a restaurant. There are many excellent Florence restaurants and listed below are a few that we enjoy and think will enhance your experience. Ristorante Ricchi- A beautiful restaurant located in the historic Piazza Santa Spirito in the Oltrarno. If you want exceptional seafood in Florence, this is the place. You can either eat outside at one of its 20 garden tables or dine inside its classy, upscale dining room.